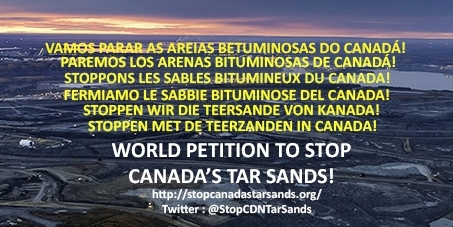 World leaders: Stop Canada's Tar Sands! - Stoppez les sables bitumineux! This petition has been created by Jeremy B. and may not represent the views of the Avaaz community. We, citizens of the world, ask our respective leaders not to implement policies that promote the expansion of Canada's tar sands. This includes support to national and international companies involved directly or indirectly in the extraction, transportation and refining of petroleum products derived from Canada's tar sands. We, citizens of the world, refuse to support an industry that is involved in the worsening of the climate crisis and that compromises the quality of life of future generations. We, citizens of the world, refuse to let an industry affect the health and quality of life for Aboriginal people living near mining facilities of Canada's tar sands. We, citizens of the world, refuse to depend on an industry that affect our health and the health of our children and declare our right to live in a healthy environment. This includes protecting our air and our water. We, citizens of the world, refuse the right to Canada's tar sands sector to destroy biodiversity, either directly in Canada or indirectly on the planet by its emissions of greenhouse gases responsible for climate change. We, citizens of the world, urge our leaders to listen to the call to action from the international scientific community towards the ongoing climate crisis. We, citizens of the world, urge our respective leaders to make policy decisions to incrementally wean us off our reliance on fossil fuels. We also ask them to take strong policy decisions to promote renewable energy and the advent of a low carbon economy. We also ask them to stop subsidizing the fossil fuel sector. Finally, we, citizens of the world, reaffirm our commitment to sanction by our right to vote and in a democratic way the present or future leaders who refuse to hear our common call.